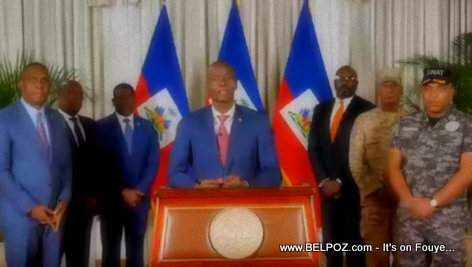 A confident Haitian president Jovenel Moise addressed the people of Haiti Wednesday November 21, 2018, and spoke firmly to the opposition in the streets and those spreading terror in the country. Here is a transcript he what the president said. "For more than 30 years, we have given ourselves a constitution that sets democracy in Haiti. It is through that democracy that every citizen can claim freedoms and freedoms without any hardship," the president said in his speech. It is also in the framework of that democracy that the people of Haiti have elected me president, in free elections, as the law of the land requires." "During my five-year presidency, nobody, regardless of pretexts, should threaten the country's interests or put our nation in danger." "Democracy demands sacrifice. Democracy demands that the rules of the game must be respected as required by our constitution." "The force all democracies is the respect of the law," President Jovenel Moise said, "In Haiti, we cannot escape this rule. We must remain in democracy to avoid sinking in to anarchy"
In matters of security, President Jovenel said there is absolutely no reason, religious, political or otherwise for people to murder other citizens or threaten to do so. "Once you cross this line, the line for respect of human rights, you will fall under the sanctions of the justice system." President Jovenel asked the the Superior Council of the National Police (CSPN) to go after everyone involved in the murder of other citizens in the country. "Impunity does not walk with democracy," he said, "The justice system must hunt down everyone who are spreading sorrow among the people or who threaten to so." "Political fignts must be done on ideals, discussions that lead to elections," he said. "it cannot be done in mayhem and destruction (kraze brize)." "For the last 32 years, mayhem and destruction has been preventing the people of Haiti from moving about their business, making the country poorer." "We are all Haitians," the president said, "Haiti is for all of us. Today, the people has voted me president to run the country, tommorrow you could be the next president. Whatever your ideology, whatever political party you are leading, Haiti is your country too. We have to do whatever it takes to make Haiti better so that our children and grandchildren can live better." President Jovenel called for a dialogue. He asked Prime Minister Jean Henry Ceant to start this dialogue and include everyone from every sector of Haitian society. The president also asked the Prime Minsiter to take every step necessary to guarantee the lives and protection of every Haitian citizen. "The government must take every step necessary to establish law and order in this country." The president said he has given specific instructions for the reactivation of the disarmament and reintegration commission and urged the government to take "all the responsibilities to continue the work of social appeasement in disadvantaged neighborhoods."